It is a cliché but sadly true! The 2018/19 Summer break is really all over! Looking back over the summer of 2019 A typical Queensland summer will include at least one cyclone; in fact Qld relies on these heavy rain events to top up parched soils and groundwater tables! This year though, we experienced extraordinary Bush Fires, more typically experienced in Australia’s southern regions, a monsoon of epic proportions in north and north-western Qld and the driest ever summer in south-east Qld as well as continuing drought in the mid and lower western regions of Qld. Our thoughts are with all our colleagues and those affected regions. In such trying conditions it is no wonder that Arborists are increasingly fielding so many queries from worried tree owners, tree custodians and gardeners more generally. Weather patterns seem to be increasingly erratic and we are now heading into late autumn with little to no rain in sight. This, of course, is not news to that offering advice or tree services however a sound understanding of how trees are or are likely to react is not only helpful but is important to our role in caring for trees and assisting to ensure they can survive these trying times. Also invaluable in explaining to our clients how resilient trees can be, what to expect of trees in questions and how to best manage their (Arboricultural) needs. QAA’s 2019 Workshop programme is full to the brim and those who have already participated in recent Workshops continue to update their skills and share knowledge with fellow colleagues. Improved understanding of tree biology, risk assessment and pest and disease identification can make the difference between early detection and successful management of tree health issues or tree health and structural failure. Attendees at our February course included employees from Swann’s Arboricultural Services and City Tree Services who enjoyed their course provided by Cliff from Trained Up. Our grateful thanks to Tom Vassallo (VIC), Mark Roberts (NZ), Mike Ellison and his team and Janet McDonald (DAF) who have presented recent and upcoming Skills Impact, TRAQ and QTRA courses. Looking to make it easier for Arborists located outside of the immediate Brisbane area, QAA strives to provide courses in regional centres. Please don’t hesitate to let us know if there is an opportunity to bring a training course to your workplace or regional area! If you let us know QAA will be only too happy to arrange it for you! If you are reading this and thinking; I’d like to compete in the Queensland Tree Climbing Championship, please mark your calendars for the weekend of 26th and 27th July! With a fantastic selection of Fig Tree Pocket’s famous Eucalypts, QAA’s popular feature event will be held in Fig Tree Pocket Riverside Reserves. Watch our website and social media pages for more information and to lodge your entry. Ps. Early entries will go into a special raffle to be announced closer to the date. Yes that’s right! Thanks to a hard-working team led by Ben Inman, Arborcamp™ is returning to QAA’s Event Calendar this year. Rocky Creek Scout Camp is the venue and the date is the weekend of 20th and 22nd September, 2019. Once again, keep a watch on our website and social media pages for more information and to lodge your entry. Wondering what it takes to offer your services as an approved Arborist or to see your company listed on QAA’s Register of Approved Tree Contractors or Consultants? Assurance and proof of work practice. That you, as a qualified Arborist know when to use climbing spikes – definitely not on your client’s prized feature garden tree! Assurance and proof that your machinery in good repair – your career and life depends on nothing less! arboricultural gear you will need! It’s easy and it all begins with a call to the Office on (07) 3821 1488, an email to http://[email protected] qaa.net.au or enquiry through either our Webpage www.qaa.net.au or message through Facebook Messenger. In short, if you display the QAA’s Logo you are driving the significant benefit of its advertisement. Members of the public expect that your Membership and insurances are up-to-date, your crews are skilled and experienced and that you are able to give the assurance (to your clients) that you are able to carry out the work that you have promised. Using this logo is a privilege not a right and it has a proven track record of qualifying your services or that of your company when competing for work. Your questions are always welcome. Safety through education and training is central to everything QAA does for its Members! As always, stay safe, stay trained and stay up-to-date! Are you and your Self-Managed Super Fund (SMSF) protected from the latest changes? Running your business and setting up a Self-Managed Super Fund can be a great way to plan ahead for your retirement or to protect your current assets from any penalties. Recently, the Government introduced Section 166 into the SIS Act 1993 (rules of SMSF). This was to give the Australian Taxation Office (ATO) more IMMEDIATE power to penalise trustees of SMSF’s if their fund was found to have breached under this Section of the (SIS Act 1993). Currently the ATO have recognised17 common breaches that have a penalty attached. As you may be aware, SMSF regulations are very complex and change all the time and if the ATO find you (trustee of the fund) have breached these regulations, they can now simply impose a penalty of up to $12,600 per breach (called a Trustee Administrative Penalty) per trustee paid DIRECTLY out of your pocket! (It CANNOT be paid out or your SMSF). The ATO wants SMSF Trustees to be more compliance conscious, and to enforce this, it is expected that the ATO will further significantly increase its audit activity on SMSFs over the coming years. The ATO has issued over $3.3 million in trustee penalties already! Don’t let it be you! We have a solution that can assist in this area! Every day matters. Contact our office today. Fitzpatrick & Co has specialised in the horticulture and arboriculture industry for more than 30 years providing assistance and financial support to companies, associations and events. We are there when your industry needs you. When we found out that Bandit Industries had been sold – well that got our attention. Everyone in the tree game knows Bandit Industries from mid- Michigan USA, and at a guess most of you would have used one of their machines at some point over the years. Bandit’s equipment has been in Australia for more than 30 years, and today and every day there are over 2,000 Bandit chippers and grinders in the hands of hard working tree crews around our wide brown land. Recently we found out that Bandit Industries had been sold – here is the whole story. The big news is that the Bandit owners did not sell the business to one of the large multi-national companies that were keen to buy. In mid-2018, now former owners, Mike Morey Sr., Dianne Morey and Jerry Morey announced their intention to sell the company to their employees. On November 1, 2018, Bandit Industries finalised its transition to become a 100 percent ESOP company (employee stock ownership plan). This is a very positive move that is being celebrated by Bandit employees, dealers and customers all around the world. It ensures the corporate culture that has made Bandit a great success for more than 35 years will remain intact. The ownership transition won’t impact the day-to-day management of the company as the management team that has been guiding Bandit for the last several years will remain in place under the ESOP. For us folks, on the other side of the pond, this is a great outcome. Bandit’s Australian dealers have been established here for decades and have excellent, long-term relationships with local Bandit owners and operators. This will stay the same; Bandit will still be Bandit. Developed with input from professionals in the rescue industry DMM’S range of Bat Rigging Plates raise the bar in design, performance and strength. Precision machining and heat treatment make them super-strong, light and incredibly versatile. The ‘Bat’ shape minimises height loss in complex rigging scenarios and generous radii allow direct attachment of textiles and rope as well as connectors. Today technology and mechanisation play a key role in extending the operational capabilities of small and large businesses while keeping skilled employees safer than ever. In any industry it can be difficult to find enough reliable, skilled workers. This is especially challenging for tree care companies due to the highly specialised nature, and also perceived risks, of their typical working tasks. In recent years increased mechanised assistance is becoming apparent in tree take-downs and trimming across Europe and North America, as well as projects including vegetation control along waterways and roads, to help offset this workforce shortage and ease pressures on business owners. 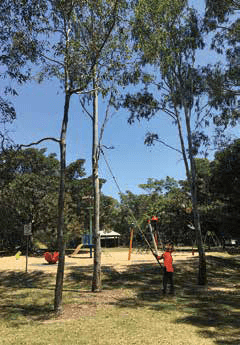 This shift in equipment utilisation may eventually be likened to that seen in large scale timber harvesting operations here in Australia, which until not so long ago were dominated by hand-falling crews working on the ground with chainsaws. During these times near-miss incidents, injuries and deaths were unfortunately frequent. Over the last few decades Australian attachment supplier Forest Centre has seen this advance of mechanisation in forestry – a change which has taken skilled operators off the ground and into the safety of a machine cabin where they are able to control felling, cross-cutting and processing functions at the touch of a joystick button – and are these days receiving increasing enquiries for this level of technology for use outside of the forest. “Our attachment range has expanded to cover 5 ton compact machines right up to 30+ ton excavators, as well as other carriers including truck mounted cranes and telehandlers” explains Forest Centre Sales manager Rey Kell, referring to a product stable of all-European brands in hydraulic grapples, rotators, tree shears and grapple saws. Challenging projects involving the removal of diseased or poisoned trees and storm blow-down timber for example can be approached with significantly less risk exposure for the operator. 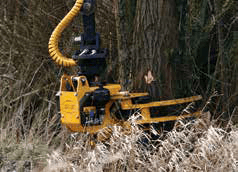 Manufactured in the Netherlands by Gierkink Machine Techniek, GMT compact felling grapples are available in two different sizes with 35cm and 50cm cut capacity, presenting capabilities for loading, cross-cutting and falling on any machine from 5 ton class upwards that can run a regular rotating hydraulic log grapple. Designed with a tilting upper frame and hydraulic chainsaw, the GMT grapples are essentially a scaled-down forestry directional felling head. A dangle mount rotator and swing yoke allow directional control when bringing down the cut piece whilst also reducing any torsional forces on the boom of a truck crane or smaller excavator. A patented hydraulic valve block built into the grapple allows all controls; jaws open/close, rotate, tilt up and saw cut to be controlled by only four buttons; two valve functions and either 40 litres or 60 litres per minute minimum hydraulic flow. Unlike other compact grapple saws no electrical control modifications, wiring, remote controls or batteries are required. 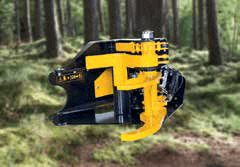 The hydraulic sequence valve also has a unique safety aspect in that the saw will not operate until there is a firm grip on the limb or trunk section you’re wanting to cut. The saw function can also be turned off for extended use as a loading grapple. 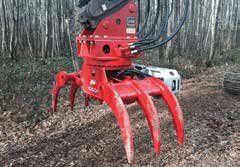 For more demanding tasks in cross-cutting and tree removal Forest Centre also offers both dangle and fixed mount grapple saw combinations manufactured by Vosch Equipment and Hultdins Sweden to suit larger machines. Carriers from 10ton class excavators and upwards offer greater stability and hydraulic horsepower, opening up the possibilities for driving larger displacement saw motors with larger pitch saw chains, single cut capacities beyond 500mm and the ability to have a higher degree of directional control when withdrawing large and heavy cut pieces from the working area using positioned type rotators. In some working environments such as cutting close to ground level, tree shears may be preferred due to their simple yet very durable cutting systems. Introduced to the Australian market in April 2018 by Forest Centre, Finnish-built TMK Tree Shears are designed with a single powerful moving jaw that draws the tree across a fixed cutting blade integrated into the lower frame of the shear. hardwoods on the two larger models), which can be fitted on machines from 2 ton up to 20+ ton. Optional equipment includes a two-stage ‘Turbo’ cylinder allowing fast cycle times without sacrificing power on machines with lower hydraulic pressures, as well as a collector arm for multi-stem accumulating. Hansa – enabling sustainable business for generations to come. Hansa, specialists in the design and manufacture of high-quality wood and brush chippers, announces the completion of their new headquarters, built to enable sustainable growth and fulfil growing demand in Australia, New Zealand and beyond. Opened by three generations of the Vogel family, the new 3000m² headquarters in Hamilton, New Zealand, stands for one of Hansa’s biggest beliefs – providing a sustainable business for generations to come. Founded by Manfred Vogel, the next generation running the show is now led by son Martin, who inherited his father’s ingenuity and has expanded the company to how it stands today, providing machines that help you work more efficiently and safely than ever before. As well as a new sustainable headquarters, Hansa’s chippers are built to be as efficient as possible by using less fuel with top quality motors finished with a non-toxic powder-coated surface. Hansa and their customers are also big believers of giving back to the land. “Most of our customers are people who put great care into their landscapes and often re-use their woodchip to enrich the environment. We want to continue to produce the best chippers to support their work, and that’s why we must also be sustainable in the way we grow as a business,” says Martin. Based in Brisbane, Hansa has been in operation from March 2018, supplying Hansa’s commercial chippers and is the sole supplier of Predator stump grinders to leading arborists and landscapers around the country. Australia’s National Operations Manager, John Lyon, is impressed with the support and feedback from the professionals in the business. Learning from its strengths, the Hansa team know customers enjoy being able to deal with manufacturers directly. Listening to its customers is a core part to how its in-house engineering team innovates. The Hansa C27HS is a highly accessible sub 750kg 6” chipper with a compact design. Featuring a Honda GX690 motor, this is one roller-fed chipper that is both versatile and easy to control, while its powerful performance appeals to both serious orchardists and arboriculture contractors alike. The predator ST-661 is a versatile handheld stump grinder attachment for the Stihl ST-661 chainsaw. With the base unit at under 25kg dry weight, is one all-access grinder that will fit any vehicle and go anywhere. With a strong reputation built over the last 35 years, Hansa’s goal is to continue building upon their quality products and service that their current customers love and rely on. Energy Safe Victoria (ESV) is reminding all arborists of the need to take extra care when working in the vicinity of powerlines. ESV’s Line Clearance Assurance Manager, Gary Wright, said trees and branches can conduct electricity and cause electric shock or death if they contact powerlines. This can happen whether you are working from a bucket of an elevated work platform, from the ground or in a tree. 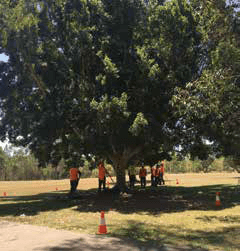 ESV has been running a safety campaign for arborists since 2014 when a young vegetation worker died when a branch he was cutting fell into high-voltage powerlines. The Don’t Put Your Life On The Line campaign is designed to raise awareness about the additional dangers faced by arborists and vegetation workers when working close to powerlines. “In addition to knowing the No Go Zone guidelines and other worker clearance requirements, this incident highlighted the need for vegetation workers to take extra precautions and carefully assess each situation to anticipate all possible safety risks,” Mr Wright said. There are a few simple steps you can take to help keep you safe. If you are using large vehicles, plant or equipment to clear trees the first step is to know the No Go Zone framework. The minimum clearance guidelines are shown on these pages. In addition to this there are three different requirements that vegetation workers may need to comply with. These depend on whether you are working for or contracted to a private company or person, a council, or a Victorian Electricity Supply Industry (VESI) company. It is important to know what skills and training you require to perform certain tasks. This will vary depending on who you are working for and the type of electric lines you are working near. In addition to the No Go Zone and other clearance and training requirements, it’s important to anticipate all risks and think outside the square. If you’re working in a tree near powerlines and particularly if you’re holding a long branch you are potentially in a very dangerous situation. ESV recommends those working for a private company or person should always maintain the 3m No Go Zone clearance from powerlines when climbing trees to remain safe. At a minimum, private contractors must comply with the requirements contained in Regulation 318 of Victoria’s Electricity Safety (Installations) Regulations 2009. If there is any concern regarding safety when clearing trees in the vicinity of powerlines, don’t proceed. Discuss job safety with the local electricity distributor before starting work. You are required to notify them when working near their powerlines. Always remember that you have the right to refuse work if the job is unsafe. All workers on a site should constantly monitor the location of machinery and equipment that could come into contact with powerlines, including EWPs, ladders, ropes, polesaws and power pruners. They should also continuously watch movements of climbers aloft in trees to warn them if they are getting too close to powerlines. Repeatedly check the location of powerlines while work is underway as their position can change significantly due to wind and temperature. Tradespeople, vegetation workers and arborists who are working near powerlines and electrical infrastructure need to be extremely careful that they or the equipment they are using doesn’t touch live wires. Anyone entering the work site needs to be aware of these risks. Actions should be taken to ensure that people who don’t understand these hazards, or are not appropriately trained and authorised, are kept well away. These guidelines provide vegetation workers with guidance on the safe working distance from overhead electrical assets. There are three different requirements that vegetation workers may need to comply with depending upon who they are working for, or engaged by, and their qualifications and training. ESV recommends private tree contractors maintain the No Go Zone 3m exclusion zone. However, at a minimum, private contractors must comply with the requirements contained in Regulation 318 of Victoria’s Electricity Safety (Installations) Regulations 2009. The latest version of the No Go Zone rules can be found online at www.worksafe.vic.gov.au. ESV Electrical Safety Rules for Vegetation Management Work Near Overhead Powerlines by Non-Electrical Workers. If you are ever unsure about what the requirements are remembered you can always call and ask the relevant distribution business for advice. If the tree you plan to do work on services a train or tram network you will need to contact Metro Trains on (03) 9610 3392 or Yarra Trams on (03) 9610 2400. Want to be amazed? Try Silky’s Root Cutting Saw. The name itself says it all – root cutting saw. But that’s not all. This particular saw is toughened to cut tree roots and resist blunting from dirt and debris. Commercial Growers will find this saw effective when cutting at the base of the tree to clear suckers or new growth away. Inevitably, the saw goes into the soil with each stroke. If you’re using a standard saw you’re going to blunt it really quickly. Fencing Contractors find this tool extremely useful for removing old fence posts. Normally you’ve got to dig them out or use chainsaws, but we all no that there’s going to be a lot of filing to do if you use that. The Gomtaro Root Cutter can solve all these problems. It’s brilliant and fast. Gomtaro Root Cutter has been designed to be an exceptionally easy saw to use. With the unique Mirai-Me style tooth, this saw gives a very clean and smooth cut. The tooth style doesn’t leave aggressive marks on the tree or its roots. If you are cutting roots to transplant a tree this is your must have tool. Why? Not only it is not going to go blunt quickly, but it’s also going to give a nice finished surface, so that the roots have the very best chance of healing quickly. As usual, Silky is a worthy addition to your kit. A local business on Victoria’s Mornington Peninsula has been busily tackling jobs from Frankston to Portsea, offering a range of services that has given it a competitive edge. Choosing machines that have the potential to multiply revenue streams, get into tight, low access areas, and increase capabilities are essential for a business with only a small fleet. With the combination of a Vermeer mini skid steer loader and a wood chipper, Clear Line Tree Solutions is taking full advantage of everything these machines have to offer. For seven and a half years, Graham Stewart, Owner of Clear Line Tree Solutions, has been providing tree trimming and removal services in the Morning Peninsula area. Graham’s first experience with a Vermeer mini skid steer loader was when he purchased a second-hand S800TX for his own jobs around the house. “I first bought the second-hand S800TX mini loader predominantly for around home. I never intended to take it to work because I had a winch on the work machine that did most of the heavy lifting. But then on a couple of occasions, I took it to work and found out how wrong I was,” Graham said. With the success of the S800TX, and after witnessing the increase in productivity the compact mini loader brought to his business, Graham made the choice to upgrade and invest in a new S925TX for more lifting capacity. The S925TX is a compact machine that has a tipping capacity of 1198.8kg and rated operating capacity of 419.6kg while reaching a maximum hinge pin height of 214.6cm. This makes it a force to be reckoned with for any size job. The standard dual hydraulic auxiliary system with the high flow can power the most demanding attachments, from the trencher to the grapple or cement mixer. The portability, affordability, and diverse range of available accessories and attachments are one of the keys benefits of the Vermeer mini loaders. The various attachments that can be used with Vermeer’s mini skid steer loader range have given Graham the opportunity to expand his business services from existing avenues and opened up new revenue streams. Graham said. Graham uses his mini skid steer loader in conjunction with his Vermeer wood chipper, allowing him to take on jobs with limited access. “The mini steer loader fits on the back of the truck, with the chipper towed behind; I can take it to jobs and unload it down the ramp. There’s plenty of spots down in the peninsula that you can’t get the truck and chipper down to. I can take the mini skid steer out and collect the materials, and bring them back to the chipper. That’s a massive bonus down here,” Graham said.